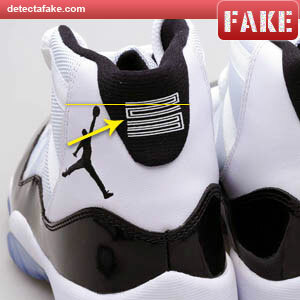 Next, look at the back of the shoes at the alignment between the "23" and the jumpman. 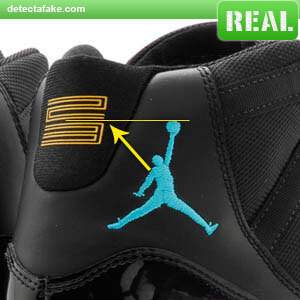 The top of the ball, on the jumpman, should align at the center of the "23". 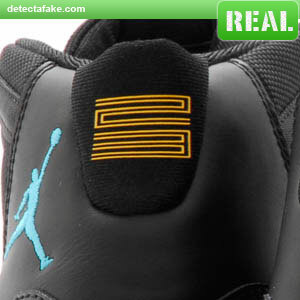 The yellow line on the real one shows the top of the ball aligning right through the center of the "23". The fake one aligns much higher, almost to the top of the "23". Next, look at the height of the "23". 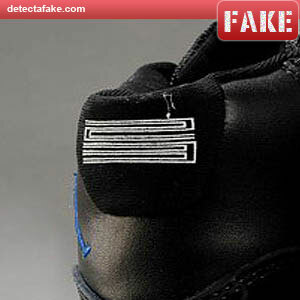 Many of the fakes are compressed together like the fake one above. It should look more readable like the real one above and the "2" and "3" should not be touching. Next, look for the logo on the tongue. The logo should align perfectly in the center of the 3rd lace hole. 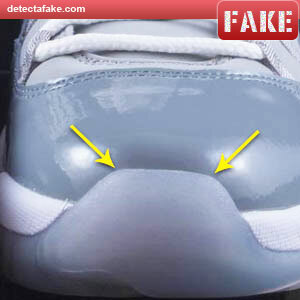 Many of the fakes, like the one above, are positioned in the 4th lace hole. Next, look for the "Greatest Player Ever" tag, inside the tongue. 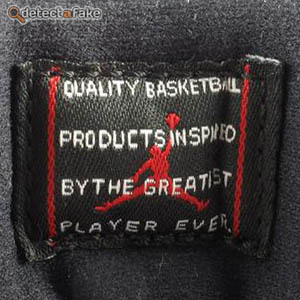 it should read: "QUALITY BASKETBALL PRODUCTS INSPIRED BY THE GREATEST PLAYER EVER". The tag should be black, with black stitching and white letters embroidered into it. 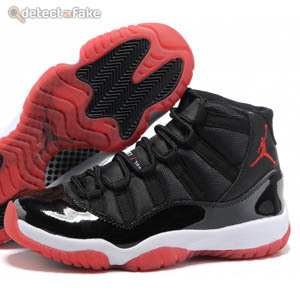 The jumpman should be red along with 2 red vertical lines embroidered on each side. Look at the tag above and compare with your tag. It should be of high quality like the one shown. 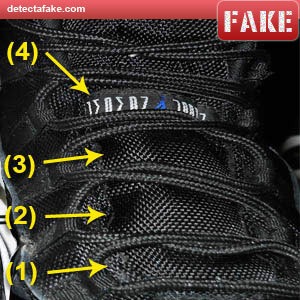 If you tag does not match any of these details, the shoes are probably fake. 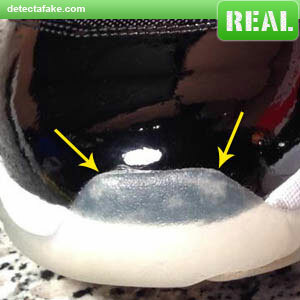 Next, look at the insole logo. 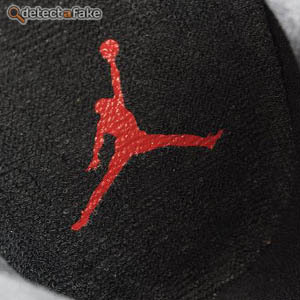 New Jordan 11 retro's will feature the jumpman logo printed on the insole. 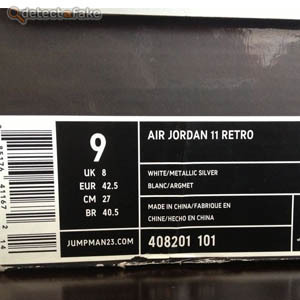 Non retro models may feature the Nike logo instead of the jumpman. check the proportions of the hands, feet and ball. It should look just like the one above. 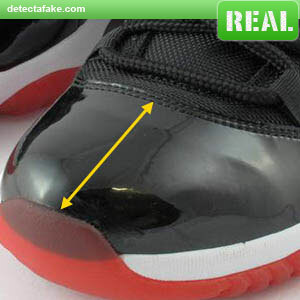 Next, look at the distance between the toe box and the stitching at the bottom of the laces. 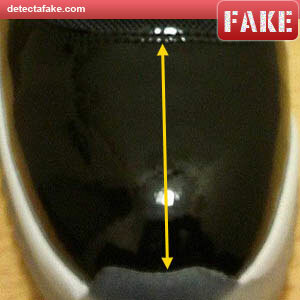 Many of the fakes have a much larger distance than the authentic shoes. 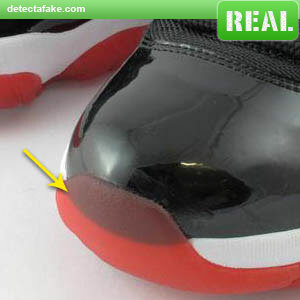 Next, look at the toe box again. The real ones have a distinctive even shape to them, as you can see in the real one. 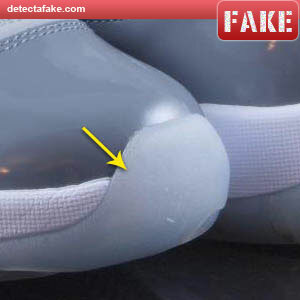 Another thing to look at is the width of the top of the toe box. 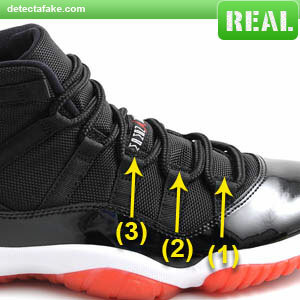 The real one is much wider than the fake, in the examples above.